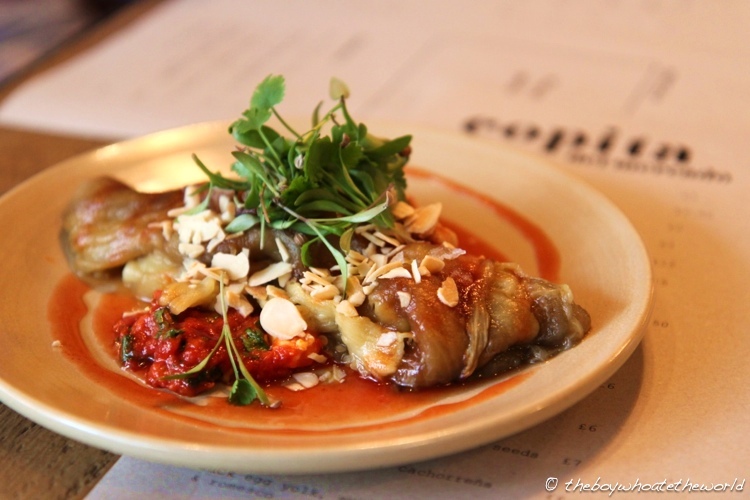 Of all the recent restaurant openings in the East End, there’s one new kid on the block which stands head and shoulders above the rest for me – Copita del Mercado. The brainchild of the team behind the ever-popular Copita in Soho, Copita del Mercado is everything I love about its Soho sister restaurant plus more. The bold, flamboyant Spanish flavours of the original are all here, just showcased with even more flair by way of slightly larger dishes and a blackboard heaving with market fresh daily specials. What’s more, it’s goodbye to queuing for your dinner table here at the new Spitalfields outpost. A much larger space just off Petticoat Lane Market means they take evening bookings here! You can make an online reservation at Copita del Mercado or browse other Spanish restaurants on Quandoo. We grazed on some of their vegetarian and seafood offerings to start. Aubergine, roasted until tender and smoky was paired wonderfully with toasted almonds and cachorreña – a gazpacho-esque sauce. 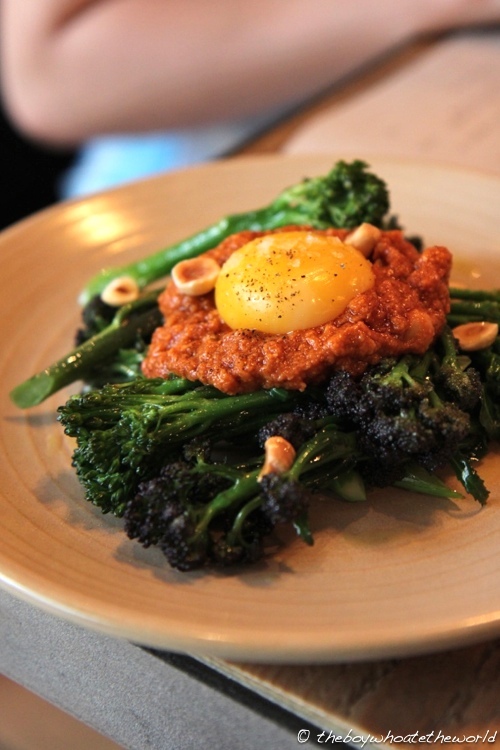 Sprouting broccoli, served with slow-cooked duck egg yolk and Romesco sauce also impressed. The broccoli was cooked to perfection, retaining just a hint of al dente crunch to it. When the oozy yolk was mixed with the Romesco, it formed a deliciously rich sauce to complement the vegetables, bursting with sweet red peppers and hazelnuts. 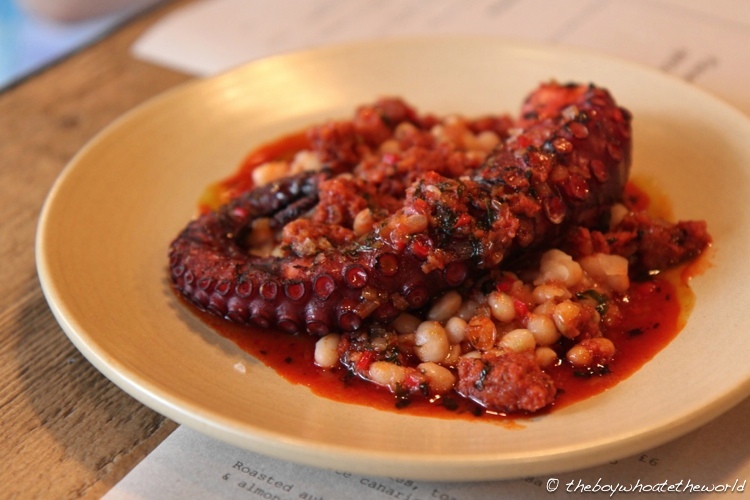 A whopper of an octopus tentacle soon followed… chargrilled till smoky and served over a bed of sobrasada (a cured pork and paprika sausage from the Balearic islands) and arrocina bean stew. The bold flavours on the whole were fantastic, however the octopus itself was a tad tough and could have done with a slower braise to preserve its tenderness. If you are more of a carnivore as I am, there are some properly meaty treats on their menu you can sink your teeth into. The neck of lamb dish was superb. Slow-cooked until melt-in-the-mouth, I loved the rich flavours of the shiny demi-glace sauce and sweet apricot compote on the side. 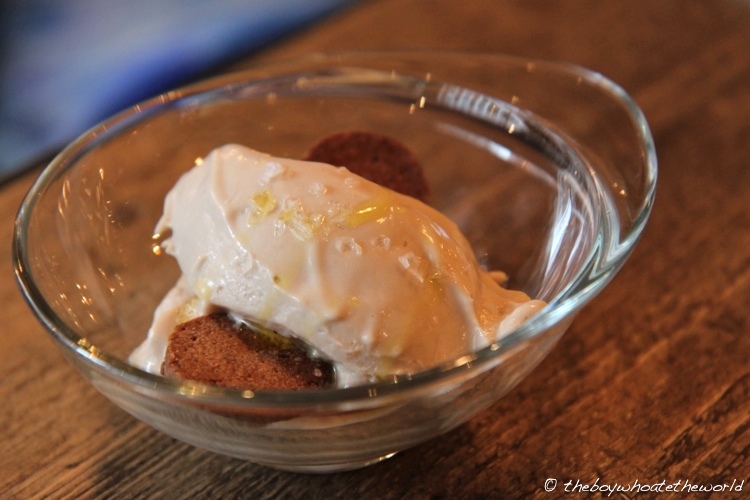 The textural contrast of the crunchy pistachio migas (fried bread pudding) coating was the icing on the cake. 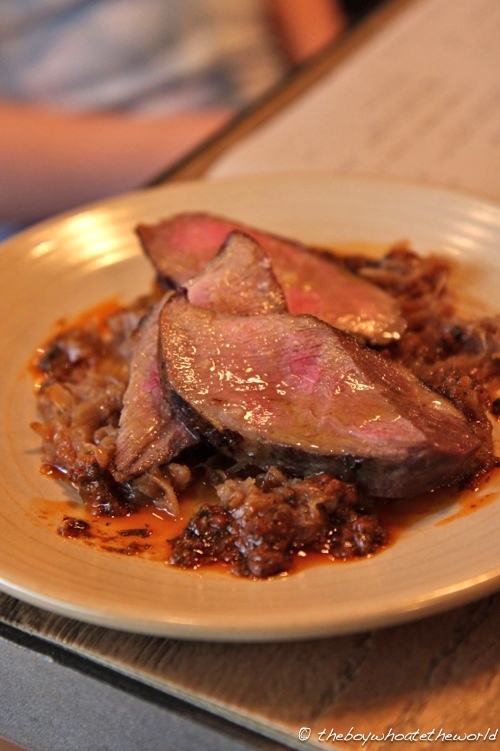 If there was one standout dish of our meal, it would have to be their acorn-fed Iberico Presa. Roasted perfectly and still slightly pink in the middle, it’s one of the juiciest, tastiest cuts of pork out there. What really elevates the dish to that next level though is their phenomenal Pinchos Morunos salsa – a complex, multi-layered concoction bursting with sweet paprika, sherry vinegar, cayenne, cumin, garlic and caramelised onions amongst other lovely things. 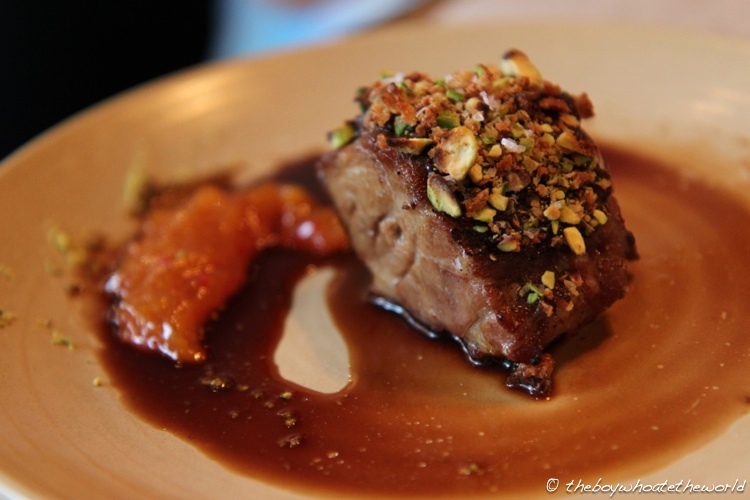 Together with the pork, it makes for one of the most moreish dishes I’ve ever eaten and it’s one I’ll undoubtedly be ordering time and time again when I revisit. Be sure to save some space in your bellies for their exquisite chestnut mousse dessert. Air-light and smooth as silk, the creamy and nutty mousse is laced with just the right amount of top-notch olive oil and sea-salt, providing both decadence and balance. 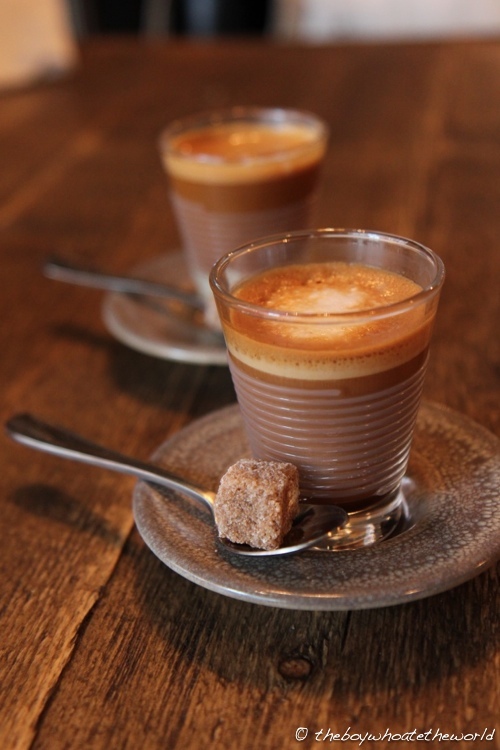 We ended with a couple of cortados – strong and punchy, just as you would get in Spain. Our total bill for 2 people, including a couple glasses of wine and coffee came up to just under £80 – not the cheapest of meals by any means, but a fair price considering the sheer quality, quantity and variety on offer. The impeccable service here is also worth a mention. Friendly, attentive, knowledgeable and honest, it’s everything you would ask for from a front of house team. Add to that a stunning, all-Spanish winelist and a premium gin collection featuring everything from old-school favourites to small-batch artisan distilleries and it’s no surprise why this place has fast become one of my favourite haunts in the neighbourhood. 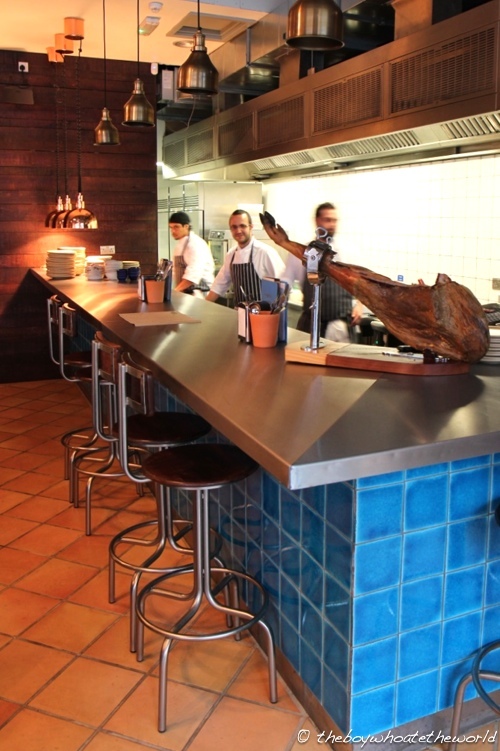 This is easily some of the best modern Spanish food you will find anywhere in London at the moment.